Crater Lake, the one National Park I always dreamt about from a young age, and I was about to finally make it there. Crater Lake is one of the furthest National Parks in the lower 48 from my hometown of Pittsburgh, I always kind of looked at Oregon and Pennsylvania being the opposite side of the coasts counterparts. After the nearly month long trip though I would be there and finally get to experience those blue waters for the first time. 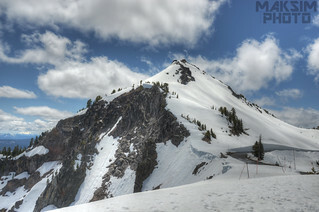 We left Lassen National Park in Northern California and headed even further North, along the way we past the beautiful Mt. Shasta which was totally blanketed in snow cover, a real amazing view. Soon enough we'd be traveling across the Oregon border for the first time. I finally made it to Oregon! The next stop of course was the elusive Crater Lake. Before arriving we had no hotel reservations (like always) no idea where we were heading, no idea where we'd eat and so on. Crater Lake was coming up fast and finally we saw a sign welcoming us to the park, we finally made it. Stopped in the gift shop/restaurant for lunch and studied the park map like we were getting ready for an SAT in a few hours. Once we left, we drove up a steep windy hill obviously taking us to the "Rim" of the lake. At the top we were surprised to see how much snow was there, us East Coasters aren't use to all that snow and snow pack this late in the year! We decided to try our luck and head into the Crater Lake lodge to see if they had anything available, not really expecting anything....we lucked out and got a room for two nights, with a view of the lake! Hard to beat that. I remember it was a lot colder than we expected, we had to buy gloves, hats, and sweatpants since most of our clothing was dirty at this point of the trip. After we bundled up we took a driving tour of the lake, unfortunately due to the snow, only about half the lake was accessible. We missed out on the Phantom Ship which was disappointing but still just seeing this incredible lake was worth the drive. We went from view point to view point admiring that blue deep water, at some points I really wanted to kick myself for not learning how to do pano shots or having a wide angle lens. The lake is huge, don't make the same mistake I did, splurge on a wide angle if possible! We headed back for the day and took in a ranger event, the ranger told us about the ancient history of the lake. Long story short the lake actually used to be a giant volcano, like Mt. Rainier. It erupted, collapsed in on itself and filled with snow/rain, hence the clear water. After three days at the Lake it was time to move on, we woke up around 5 am and were surprised once again my mother nature, it snowed a few inches overnight and our whole trip to our next destination of mostly downhill. That made for a fun slippery trip. Stay tuned to see where we head next!